Residents can make a difference through the Darke County Parks’ Adopt-a-Bird program, which allows people to “adopt” a bird through a year-long donation. DARKE COUNTY – Darke County Parks provides food, medicine and, above all, a home for four raptor species. Each of the five birds Darke County Parks houses have been rehabilitated and can no longer be released into the wild due to injuries that prevent release into the wild. Caring for a bird of prey is an expensive endeavour. Feeding just one bird can cost anywhere between $60-$80 a month, and that doesn’t include medication, equipment or facility expenses that also play an important role in the care of these animal ambassadors. 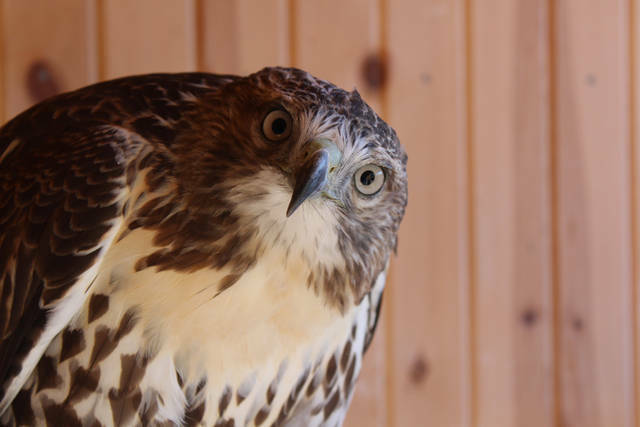 A $40 donation includes a certificate of adoption, a full color photograph of “your bird” and a complementary pin from the Darke County Parks Raptor Education Center. A $75 donation includes all of the above as well as a personal meet and greet with “your bird” for up to four people. All adoption donations help offset the cost of care of “your bird” and can be renewed annually. For more information on how you can donate or to see the raptors in person, visit the Darke County Parks Nature Education Center or contact the park office at 937-548-0165 or info@darkecountyparks.org.